Dr. Edward Bach (24 September 1886 - 27 November 1936) was a physician from England and became dissatisfied with the conventional treatment of people whereby physicians focused on treating diseases not the whole person. His belief was that we suffer from illness due to disharmony between body and mind. Dr. Bach began working on his own remedies made from plants and in 1932 discovered the first 12 remedies. In 1933 followed the second group referred to as the 7 helpers. **Rescue Remedy - a wonderful blend of flower essences which helps with stress, fear, anxiety and traumas. This is the one flower remedy that everyone should carry with them at all times - along with Arnica 30c (homeopathic remedy). For more details on each Flower Remedy - Please feel free to call, we will be more than happy to help you understand the use of these flower essences. Aromatherapy is the science of utilizing concentrated aromas extracted from plants to balance, promote health, mind and spirit. The art of using aromatherapy in treatments of acute and chronic conditions plays an important part of holistic treatment which helps the client regain their sense of well being and vitality. When purchasing essential oils, it is important that the company distribute to you the purity and quality assured by GC/MS Laboratory Analysis. This analysis reveals the safety, quality, chemotype and origin of the essential oil. 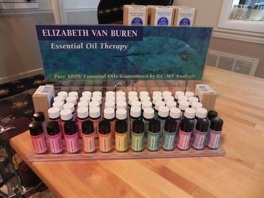 Essential oils / aromatherapy, if pure and undiluted, should not be directly applied to skin without using a carrier oil. All oils have a medicinal property and should be used with caution and under supervision if treating a medical condition or if you are currently taking medications. For example: Essential oil Rosemary should not be used if you have a history of seizures or high blood pressure. For more information, please feel free to contact us or visit the National Association for Holistic Aromatherapy (NAHA).